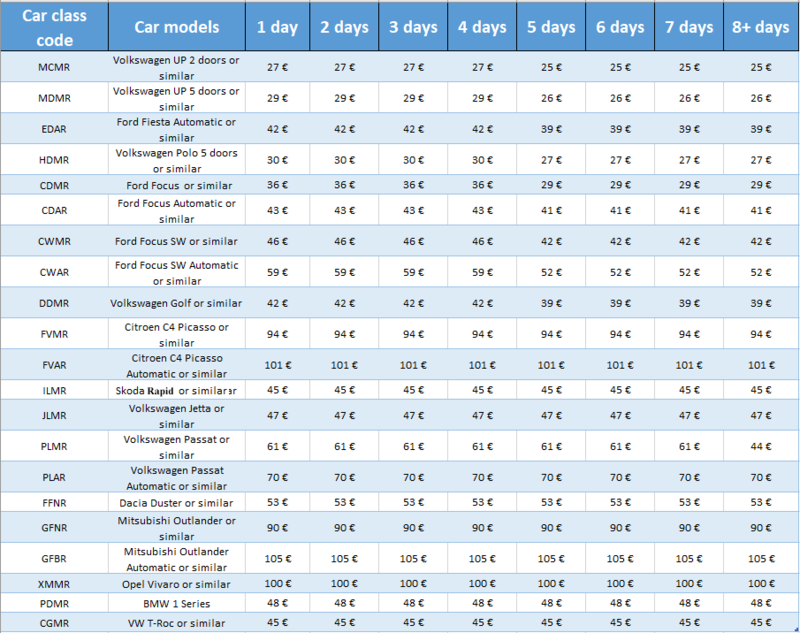 2.1 The fees are established and stated in EUR/day and they include: VAT,RCA Insurance (Compulsory Civil Liability Insurance for Motor), Road tax, Road Assistance with national coverage, the oil, Vehicle maintenance, suitable tires, depending on the season ( winter tires between 01 November – 31 March and summer tires between 01 April – 31 October), technical support 24h/24h. 2.2 The rental fee does not include the following: fuel costs, road taxes (others than Vignette, included in the rental price), any fines received for not complying with the driving rules on public roads and the national legislation in force, bridge passing taxes, stationary taxes on airports, etc. The full payment of these amounts shall be incurred to the CLIENT. 2.3 The full payment can be made in advance, via bank transfer, on www.klasswagen.com website or at the signing of the rental Agreement by credit cards (VISA, MASTERCARD) in HUF (for Hungary) / RON (for Romania), calculated according to the Unicredit Bank exchange rate + 1% on payment day. 3.1 KLASS WAGEN provides shuttle service (shuttle bus) free of charge for its clients from Departure Terminal of the airport to the Klass Wagen working point and vice versa, located in the place where delivery and returning of the Vehicle were mutually agreed by signing the Rental Agreement. 3.2 To avoid commission of offenses, the rental car was handed to the customer with a copy of the original bead. Klass Wagen Hungary Kft is committed to make available, on request, to any state institutions the original car bead within 48 hours. 3.4 The CLIENT acknowledges and verifies the Vehicle’s situation before signing the Rental Agreement and any complaints regarding its situation shall be mandatorily brought on delivery date and they shall be detained in the Delivery Paper/Returning of the Vehicle, at the “Delivery” section. The CLIENT is fully and directly responsible for any damage which has not been mentioned in the document. Claims/objections regarding the Vehicle’s situation following the delivery are not acceptable. 4.1 The CLIENT takes full responsibility (financial, civil and criminal) for the non-compliance of the usage conditions provided in the Rental Contract. 4.3 The Vehicle shall be used exclusively on Hungary’s territory, crossing the boarders being possible only in the case when the LESSOR gives its written consent through a document that stipulates expressly this, by paying down an additional fee per day (provided in the first page herein) for each day spent outside Hungary. Outside Hungary, KLASS WAGEN does not offer road assistance to the CLIENT. Consequently, this service is not included in the rental fee. The repatriation fee of the Vehicle to the Hungarian border shall be entirely incurred to the CLIENT. Leaving the territory of Hungary with the rented Vehicle, is possible only to the following European Union countries: Poland, Austria, Slovakia, Czech Republic, Bulgaria, Romania, Serbia, Greece, Montenegro, Former Yugoslav Republic of Macedonia (FYROM), Croatia, Slovenia, Bosnia & Herzegovina. Taking into consideration that the Cross Border service is not available for all categories of vehicles, the CLIENT declares that he has verified the availability of this service before confirming the reservation. 4.6 If the car malfunctions or takes any other damage, the repairs must be done by an authorized service location elected by the LESSOR only with consent of the LESSOR and in accordance with its instructions. 4.8 In case of accident/incident or any malfunction, the Technical Assistance phone number is available NON-STOP 0036.203.652.558 and the CLIENT undertakes to inform without delay the LESSOR which will assist him and give all the instructions according to the situation. By signing the terms of the Rental Contract, the CLIENT accepts the terms and conditions of the insurance with the franchise (Collision Damage Waiver - CDW) contained in sections 4. and 6. and through which the financial responsibility is reduced regardless of the culpable party for producing the ensured event, to a mandatory minimum amount for theft or for damaging the rented Vehicle. The minimum mandatory amount represents the insurance franchise (excess) which is the equivalent of the guarantee, object of Section 6 below. To have the costs of food and accommodation or transport to home (only on Hungary's territory) covered, the CLIENT has to hand over on returning date of the Vehicle the Fiscal Bill representing the costs incurred with needs to mandotary be issued with the identification data of the KLASS WAGEN company mentioned within the Rental Agreement. 8.8 SMOKING IS STRICTLY FORBIDDEN in all vehicles rented by KLASS WAGEN. In case the Vehicle is returned with proofs which confirm smoking in the interior of the Vehicle, the CLIENT shall pay a penalty tax amounting 124 Euros to KLASS WAGEN. 9.2 The CLIENT consents that the Rental Agreement is governed by the legislation in force in Hungary and any legal action shall take place in Hungary (for the vehicles rented in Hungary). The CLIENT consents that any additions or amendments to this terms and conditions are null and void if not convened in writing and signed by both parties. 11.1 KLASS WAGEN HUNGARY KFT („KLASS WAGEN”) will process the personal data provided by the CLIENT before or during the performance of the rental agreement in accordance with the applicable personal data protection legislation. CRN.01-09-305681-Company registration number Klass Wagen Hungary limited liability company, Tax number :26170031-2-41 .